During February 2002, a salvage excavation was conducted in the southern part of the village Nein (Permit No. A-3600; map ref. NIG 233–4/726–7; OIG 183–4/226–7), after ancient remains were damaged during work by the Electric Company. The excavation, on behalf of the Israel Antiquities Authority, was directed by A. Mokary, with the assistance of A. Hajian (surveying and drafting) and D. Syon (numismatics). 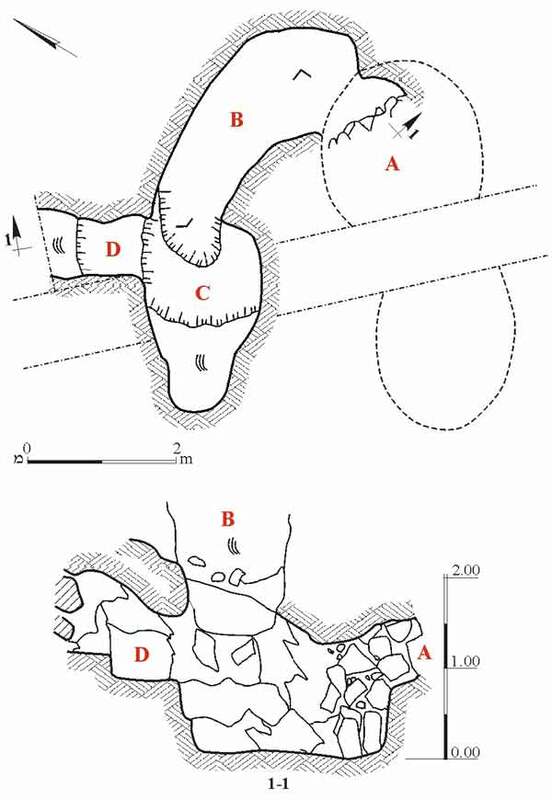 A subterranean complex that was hewn in soft limestone bedrock was exposed (Fig. 1). Two steps (D; width 0.9 m) descended from the northwest, probably from an opening that was not exposed, to a round cavity (C; 1.0 × 1.6 m). A rock-cut step in the floor of this cavity led to a long tunnel (B; 1.5 × 4.0 m, height 1.5 m), which in turn led to two adjacent cisterns (A). Although the cisterns, which were located beneath a street, were not excavated, their shapes could be discerned, as well as traces of a partition that had once separated them and was removed in antiquity. Numerous fragments of pottery vessels from the Early Islamic period were discovered in the soil fill from the bottom of the system, including barrel-shaped jars with a tall neck, plain rim and a ribbed body, decorated with white-painted lines and a few buff-ware jugs. In addition, two coins were discovered: one, on the steps in the entrance (D), was a silver dirham from the time of Harun al-Rashid (IAA 102662), which was struck in 797 CE at al-Muhammadiyya (Teheran), and the other, discovered in the tunnel, was a Byzantine bronze follis from the second half of the sixth century CE (IAA 102661).